This text is an adopted version of my speech at the German fashion lifestyle & web community conference RE:PUBLICA, on May 6, 2015 in Berlin. The speech comes together with a series of images and charts and cannot be understood without. To get the spirit of the presentation in German, there is a YouTube video clip which is available here. In this article, I want to sketch out a completely new approach to how we see and look at Europe. The aim is to reflect on the possibility of a European utopia in the twenty-first century, which is no longer the idea of a United States of Europe, but of a European Republic - thus a proposal for a new narrative, for which the search is already on in Europe. This text is no ordinary text on Europe, its institutions or the euro-crisis - all too often boring, technical, confusing or dry. This text aims essentially at Europe`s emancipation. It is about a European Republic as well as about freedom, bulls and caps and – last but not least – women! So, what has all this got to do with Europe? 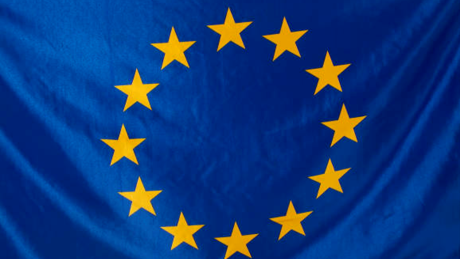 This is the symbol that stands for Europe, the EU. But this symbol doesn’t work anymore. This symbol has become that of a technocracy, a system run by puppet-masters, a market without a state behind it, a European currency without a European democracy. 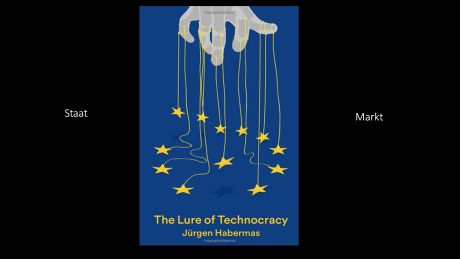 This image has not been plucked from the mind of a populist, but is the image chosen by the most famous living German philosopher, Jürgen Habermas, for the cover of his new book, The Lure of Technocracy. We are living in a formal European governance system, which has lost the essential function of a political system, which is providing the public good. The buzzwords with which the current euro-crisis is negotiated are: governance, federation, integration, structural reforms, growth, competitiveness, subsidiarity. None of these words is clear; none of these words is warm; none of these words contains any normative grounding; none of these words creates a vision for Europe or unites its citizens behind a common good and a common goal, as they are all formal organisational principles. The existing EU system is the embodiment of post-democracy, or as Colin Crouch put it: “You can always vote, but you have no choice”. Anyone who opposes the current politics of the EU must also oppose the system itself. This is exactly what is being demonstrated in Greece: it’s the ‘troika-institutions’ versus the Greek people. We have obviously become so lost on our path towards Europe that we now find ourselves in a dilemma, a catch-22 situation: under the current democratic conditions, the European system cannot generate the solutions we would need to make the currency union work in a democratic and social way for everybody. Somehow, not one of us can imagine a future without Europe, living as we do all together on the same continent; but somehow this Europe, this EU, has reached its end. It is exhausted, incapable of reform and no longer capable of achieving majority support. A dying political model – a model which some are now protesting fiercely against. In the three big member states of Germany, France and Great Britain alone, more people are against the idea of a United States of Europe than in favour. Less than 50% of European citizens are happy with European democracy in its current form. This proves that the idea of a United States of Europe no longer has any political currency. Indeed, this raises the question of what is to be done in this quasi-Hegelian moment, in which a system is exhausted, but at the same time lacks the power to reform itself, frozen as it is in a populist state of shock. 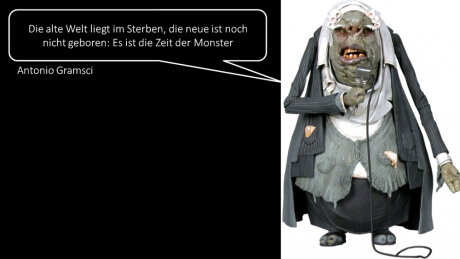 In a recent interview on Spiegel Online, the French economist Thomas Piketty opined “we have created a monster”. A monster, as in, a political system in which we separated the state and the market through the 1992 Maastricht Treaty, a system in which decisions over the currency and the economy are made at a European level but those regarding taxation and social policies are for the most part left to national governments. This cannot work. Expressed more precisely: the central role of the European Council in the EU’s governance system is a systematic obstacle to finding European solutions. The costs of harmonised solutions are nationalised. The European solution doesn’t work because the respective “national interests” are invoked. Let’s take a minute to talk about Greece seeing as it’s so topical – but most importantly because it’s so shameful how the discourse surrounding this issue is now being conducted in such chauvinist terms. Rumours are swirling that a “Grexit” may be on the cards, and that the financial markets have even already priced in this possibility. While writing these lines at the end of June 2015, we are again heading from one “crisis summit” to another “rescue plan” without seeing an end to that disastrous and distorted discussion or any sign for a vision for Europe in these negotiations. The negotiations are going around in circles, because they have no focal point, to which Europe should have been heading. Once again, Greece is lurching towards bankruptcy and it is easy – far too easy– to mainly blame the Greek government. This argument all too easily tempts the rest of the member states into acting passively and it deflects our attention away from mistakes that were made, away from the symbiotic economic interconnections between the eurozone countries and away from structural problems that cannot be specifically blamed on Greece. In the current debate on the subject, however, Greece’s impending national bankruptcy and its potential exit from the eurozone is framed as a purely national problem – which, economically speaking, is not accurate. It has now been widely recognized that the EU and the IMF made several big mistakes. In particular, economists from around the world are broadly in agreement that the policy of austerity imposed on Greece by its creditors has ultimately done more harm than good. This is not the place to reiterate all the many aspects of this economic discussion: what is important to note is how it is being dealt with in the European context: we nationalise our problems, we operate by pointing the finger of blame at one another, dividing Europe into North and South, and we simply do not feel like a community that will stick together no matter what happens. That is not a symptom of what is problematic, that is Europe’s actual problem! The same also applies to the discussion over the refugees in the Mediterranean: if a head of government – I won’t name the country here – can return from a meeting of the European Council where the rescue of these refugees in the Mediterranean has been discussed, only to announce on national television that “I have made sure in the EU that no more refugees will be coming to our country”, then Europe has made a mockery of itself. Yet this is the state of affairs today! This current Europe is like a threefold perversion of all the values which Europe actually stands for, and for which the EU received the Nobel Peace Prize: freedom, democracy, and a social market economy. As a result Europe is suffering from its own negation: whenever Europe and its values are blatantly renounced, Europe cannot exist! Europe is not working, or at least not like this. It is therefore time to turn Europe on its head and remember what it was originally supposed to be. As early as 1964 Walter Hallstein, the first president of the European Commission, said: “The aim of Europe is and shall remain to prevail over the individual nations and to organize a post-national Europe.” Today, at the beginning of the twenty-first century, it is high time that we remember this once more. The founding idea of the EU is also where Europe’s future lies! Before you now start to think that I want “more Europe” and “more integration”, let me assure you: that is exactly what I don’t want. I would like to see a truly different Europe, not more of the same. Above all, however, I would like us to leave this confused mode of discourse in which we always seem to discuss the EU and its member states in a vertical manner – either more power to Europe or more to the individual nations, more rights for the European Parliament or more for the German Bundestag. Rather, I want us to begin to grasp the fact that we all are Europe! The key thing today is not further integration, since Europe is now almost completely integrated in terms of economic and monetary policy. European integration is thus yesterday’s word; tomorrow’s is European democracy. The problem is that political and social integration have not kept up with economic integration; they are now out of step with Europe’s economic unity. The key thing today is therefore to build a transnational European democracy that goes beyond nation states – if we all agree that we have no wish to roll back the euro, but also that we have no desire to continue living in a “time of monsters”. Borders come and go: but Europe stays! 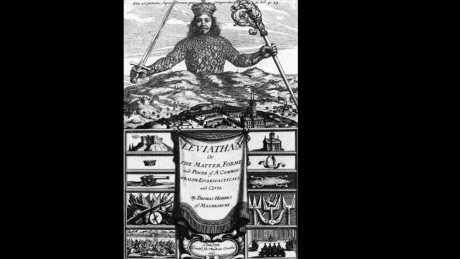 The state, the masculine leviathan, the United States of Europe – that’s in the past that belongs to the twentieth century. “Borders are so 80s” was a slogan used on the Pirate Party’s posters for the 2014 European elections. The vision of Europe in the twenty-first century that we want to offer here is that of a European Republic. In the twenty-first century the European project needs to frame itself within a new concept and for that reason – nomen est omen – it also needs a new name! But a picture speaks a thousand words, so allow me to now take a quick detour into art and cultural history and show you a few pictures that you come across when you search online for Europe: art history in particular already contains a wonderfully powerful tale of Europe for us to explore. I would like to start with a picture rich in meaning. It is a depiction of freedom and was painted by Arnold Böcklin in 1891. 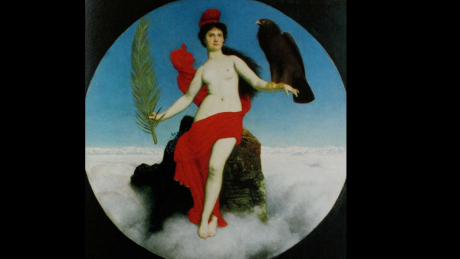 It is clear to see that freedom is a woman wearing all the insignia of power: on one arm, the eagle, the embodiment of worldly power and a heraldic animal still found on many flags today, on the other arm the palm branch, byword for the Res Publica Christiana. This evergreen plant is an expression of divine omnipotence. The image is circular: freedom rules the world. Simply leaning against a rock, she is standing on the clouds, her kingdom is infinite and she governs across borders and nations. On her head she is wearing – and this is significant for the rest of my lecture – a bonnet rouge, the red cap of the French Revolution. Painted in 1891, this cap is the symbol of revolt against the authorities. It is the republican cap of a sovereign people. This cap is part of a centuries’ old tradition: it is the Phrygian cap. The Amazons, who wore them while besieging the Thracian army, wore it. The cap symbolizes – you might laugh – bull’s testicles, which were originally worn on a string around the head as a mark of power. This picture of “Freedom” by Böcklin bears no resemblance to the monolithic state, which is depicted as a man, powerful, bestowed with crown, sceptre and sword – the monolithic national state which is now causing Europe to rupture, which refuses to allow Europe to come into being. I shall reiterate: the woman of Europe, the woman Böcklin portrays as freedom – this woman has been abducted by a masculine bull! 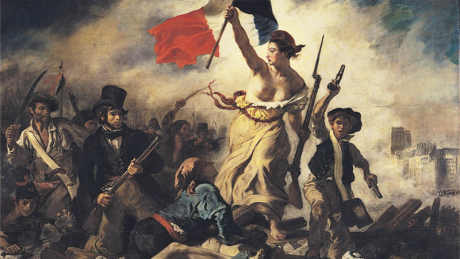 The fine arts also teach us that Marianne, the republican leader of the French Revolution, was a woman. She too wore the bonnet rouge. A woman, freedom, the bonnet rouge – as symbols of emancipation from authority and symbols of the republic – stand opposed to the (nation) state, borders and (masculine) power: three expressive images telling us that Europe is a woman, the republic is a woman and freedom is a woman! “The European Republic is under construction” means, in other words, the overthrow of the masculine Leviathan, the nation state. Europe is freedom, emancipation from the nation state: Europe is only democratic, free and possible as a Republic! Let’s make an interesting comparison with images of Europe from today. Men as you can see, dominate the current discourse about Europe! We can see that in this picture. This is what we find wherever a discussion about Europe is currently being held; at the European Central Bank, the European Council, talk shows, at the German Federal Constitutional Court in Karlsruhe or in the current Greek crisis Ecofin meetings: only men! Men, mostly lawyers and economists, and mostly elder, are the ones who “talk about” and “take action” over Europe, and consequently the discussion revolves around borders and national interests; the female, borderless, republican, social and young side of Europe doesn’t get a look in! 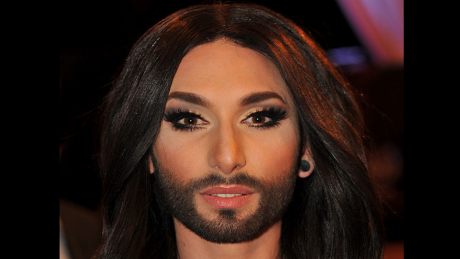 Conchita Wurst. At the 2014 Eurovision Song Contest, Conchita Wurst won the hearts of millions of viewers with her song “Rise like a Phoenix”. Conchita Wurst is Europe! Many people clearly felt like she was speaking to them and they saw her as a symbol of Europe. And we should really be proud of this: only in Europe would Conchita’s victory be possible today. It is hard to imagine it happening in either China or Russia, or even in the USA. What does this now mean for Europe in the twenty-first century? By the way, to push this one step further, let’s move for only a second from Conchita Wurst to the Mona Lisa of Leonardo Da Vinci. 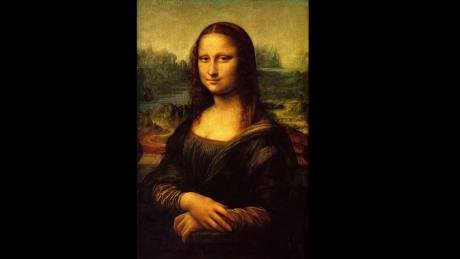 In his brilliant essay, Sigmund Freund describes how the Mona Lisa mirrors Leonardo Da Vinci's (assumed) homosexuality and states that the Mona Lisa is perceived as being so beautiful by so many people just because, if you really look at her, you cannot see whether she is a man….or a woman: she is the unity of men an women! The female side, the republican and social side must thus be included in the European narrative: Europe is a political entity across national borders and that is exactly what the term republic stands for: since the Middle Ages, a republic has been the embodiment of a transnational community and legal system. 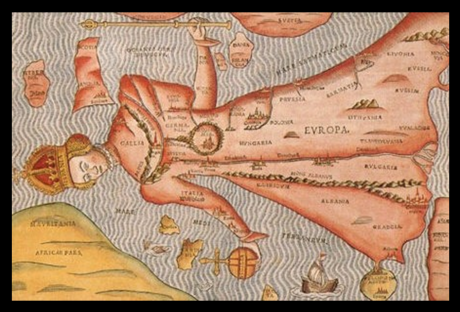 This map is of 1537 and it shows a female body under which and in which each and every monarchy or “nation” (they didn’t exist by then) or region or people or ethnicity finds its natural and organic place. The symbolism of this map tells us that everybody has place and space – and even a specific function – in the organic body of Europe: Spain (by then the Habsburg Monarchy) is the head, France the breast, Germany the heart, the Danube the aorta etc. They can only live together: no head without breast, no heart without head etc. For today’s UK – struggling with a distorted and silly debate about “Brexit” the symbolic message is: together with Denmark, today’s UK (formerly England) constitutes the left arm, which – above all – holds the earthy sceptre. If you cut the arm, Europe is amputated, but the left arm would die: an arm doesn’t live alone! Having an organic place in Europe is very different from the current discourse about “losing ones identity” in Europe. I think that we should be again inspired by what our collective historical and emotional memory, contained in maps likes this, conveys to us. We also see that Galicia is one of the entities living under the long, wide and soft dress of Europe, so today’s Ukraine is also in. We also see that Europe ends at the Bosphorus, which may explain some of our contemporary problems with Turkish EU membership. There are other messages in this map, which dates from a time when people could still read pictures, because most were illiterate. It is, indeed important that Europe is a woman, wearing a long, wide and smooth dress. The allegory offers protection, security, fertility, nutrition, and, last but not least, beauty. Nothing of that can be found in today’s (male) EU. It is time to make a future out of history! Lastly, the picture tells us that every region, every people of Europe – Gallia, Teutonia, Scotland, Venezia, Catalania, Bulgaria, Grecia - can stay as it is, is needed as it is, and does not need to “spiral up” in a federation of nation states, in an universally disputed “Einheitsbrei” resembling smashed potatoes with the European Union placed on top of it depriving everybody of identity and competences. Instead, the map tells us that one does not lose one’s identity in Europe, but contributes its identity to res public europaea, the common European good, which is presented to us – this is in symbolic terms of utmost importance! - as a common body. As you can see, this map solves e.g. today’s Scottish or Catalan question and makes it irrelevant: both – and others - could easily live under the roof of res publica europaea, a European Republic, providing legal equality for citizens, if we weren’t caught up in a dispute about nations and subsidiarity. Europe is the common legal roof; below that roof, every people is autonomous. National borders come and go, basically they are a man-made artefact of history, a fiction, whereas regions are authentic reality and Heimat to people. It is important in this context to remember that until around 1880, Europe was much more borderless than today and you could travel from Paris to St. Petersburg without a passport. We have been deconstructing borders again: the Schengen zone and the euro currency are examples of today’s efforts to break down borders in Europe. Yet it seems that we don´t want to abandon other, much more important national borders, which we hold against Europe, when it comes to administrations, social or tax issues, and which prevent the emergence – and emancipation – of a true European political entity. My first example is the location of major industry clusters in Europe. It is not difficult to see that these are not organized “nationally”. We can see transnational industry clusters, but above all we can see a great inequality between the centre and the periphery in Europe; and a great inequality between urban and rural areas: this is happening all over the EU and even within Germany. And that says it all, really: we are still designing our EU policies along national borders, which have not existed in industry and in the supply chain for quite some time. For example, a German car is not German at all: it has leather seats from Italy, tyres from France or screws from Slovenia, but it still ends up included in Germany’s export statistics. Thus, national economies such as Slovenia’s are largely dependent on the German supply chain and in this sense are no longer autonomous national economies. So we essentially have exchanged market competition for citizen competition, because we allowed tax and wage shopping within the EU for companies. Further, while Germany is allegedly paying for everything in Europe, according to the distorted public discourse, the numbers tell a very different story: Germany has contributed largely to macroeconomic imbalances of the Eurozone through “beggar-thy-neighbour” policies and wage dumping; has made huge profits from the single European market, the euro and even the euro crisis, including almost €30 billion through negative interest rates on its government bonds, for example. But the German model isn’t working for the rest of Europe! Not to mention the fact that Germany’s dominant role within the European economic governance system doesn’t work. And finally is it not even working for Germany, as even if Germany as a country “cashed” all these statistical gains from single market and the euro in, these gains have not been distributed evenly among German citizens (let alone Eurozone citizens), which explains why ordinary German taxpayers feel “overstretched” today in solidarity with Greece: all Germans haven’t necessarily benefited at all from the euro in the first place. As a result of this nationalistic approach to EU politics, we are in effect perverting the protective function the state serves for its citizens: the EU member states now find themselves in a race-to-the-bottom contest. I am reminded of that old advertisement with the Duracell Bunny: Germany is currently the bunny with the most powerful battery, but at the cost of its neighbouring countries. The flawed structure of European governance still driven by national borders where they should not be can be applied to nearly all policy areas of the EU and they often block good policy results for European citizens. Take, second example, the European energy market. In recent years, sustainable energy has been incentivized through subsidies, which vary from country to country; energy grids, however, are still regulated on a national level. What about the energy union? If Portugal has a surplus of sustainably generated energy, this electricity cannot be fed into the French network, for example, because French energy companies lobby behind the French position in the council. By now Germany has learnt that its famous Energiewende, the transition towards renewable energy, can only work if it has a European dimension – but the decision to launch the Energiewende was made unilaterally by Germany. Etc. Example number 3: The planned capital markets union. The plan is to mobilize private money and hedge funds for investments. In the European Commission’s Green Paper, all kinds of incentives are planned to make investing in, say, small and medium-sized businesses appealing to investors, through tax breaks for instance – but this would of course vary from country to country: hence, a capital union based on nationally varying tax incentives is a contradictio in adjecto. The real problem for investment in transnational industry clusters in border regions is national insolvency rights, because the investor does not know which law would apply. Instead of tackling this problem upfront, harmonizing or developing a common insolvency right, the EU flees into a formal rhetoric of structural reforms and credit crunch: the EU is actually very smart in not talking about the Elephant in the room. Example number 4: digital Europe. We all know – and this has now even been shown in studies by Deutsche Bank – that poor broadband provision is a decisive impediment to growth in rural areas. That’s why we now have the concept of a “digital union” which even a German European commissioner is trying hard to promote. However, the financing and infrastructure of this venture remain largely in the hands of national governments, which often don’t have the money. The great networks of the past century, like telecommunications, electricity etc., which were the foundations of growth in that century, were developed by means of state monopolies, however. Today, instead, we want these networks to be either market driven or consumer driven forces. The problem is: today’s rural areas are deserted. There are no markets and no consumers out there. This is also, why Europe’s current buzzword for everything – ‘structural reforms’ – is largely meaningless: where there is nothing, there is nothing to reform. By contrast, the EU – because it is not a “state” - is not allowed to use its “own money” — let alone loans – in order to provide these rural areas with suitable infrastructure. Yet, the market itself will not deliver: building broadband networks in Amrum or in Ardeche is not worth the hassle. And so we are failing on both accounts; we are not providing a European internet on a global scale according to EU rules, nor are we supporting these rural areas. This seems to be the model for many EU politicians. In this way, we are fossilising regional differences, especially between urban and rural areas, via nationally organised policies – and these differences will come home to roost politically. Today’s social crisis is a crisis between city and country; but above all it is populism which is eroding Europe’s growth. Support for populist movements is becoming a problem in rural areas for the most part, and this is the case all over Europe. 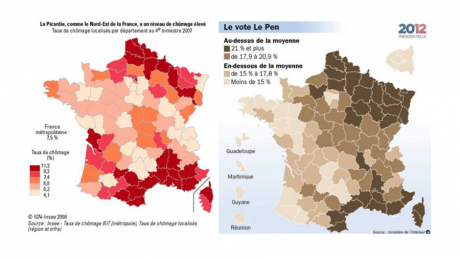 As a result of this rural social crisis we now have a European election crisis: just look at this map for France, which shows that support for the National Front is particularly high in rural areas with high rates of unemployment. The positive correlation between rural, unemployment and FN vote is nearly one to one. 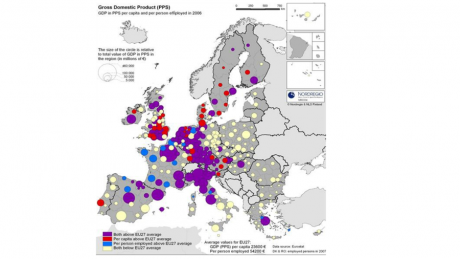 The map of unemployment and the one which shows the FN vote are nearly identical. Let’s take a look at Great Britain: the northern – and rural – areas in particular tend to vote UKIP. The little industry that remains is, however, especially dependent on the European single market (not in absolute, but in relative terms). In other words: a UKIP vote would particularly damage these deindustrialized regions in the north of England — the very regions where voters opt for UKIP. This largely rural social crisis we have today is waiting to happen on a European scale tomorrow! Do national strategies help us come to grips with this problem? I’m afraid they don’t. We have to consider urban and rural areas together once more: the social crisis currently happening in the rural areas is the populist, and therefore Europe-wide, crisis of tomorrow. These regions all over Europe should be supported by the state, above all in terms of infrastructure. As I mentioned, structural reforms – the current buzzword for many EU politicians – are not going to help here. Of the 6 billion euros set aside to tackle youth unemployment, only 25 million have been used, because these rural regions have no infrastructure, no small and medium-sized businesses, and therefore no work for young people. We are destroying the rural way of life, instead of building more decentralized lifestyles. Either we leave these regions devastated and we basically “feed” these regions on a European scale through fiscal redistribution from urban/ industrial regions to rural, in which case they could become our resort for leisure; or we rebuild the regions. This is our choice, not nationally contoured policies within the Eurozone. What we need to do in Europe is two things: engage in the protective function of the state for its citizens, by ensuring that all European citizens can basically and permanently count on one thing: the principle of political equality! This is the European roof of res publice europae according to that map of 1537. Below that roof, we need to rebuild vibrant and largely autonomous regions, which are reconstructing what Pierre Rosanvallon, the great French sociologist, would call “social bodies”. By the way, this goes along with the other megatrend detectable in Europe, which is about towns and metropolitan areas, which want to be more independent. These towns, along the rural regions, can be both places under the new dress of Europe, a modern twenty first century dress that is all about a “Network Europe 21”. This Europe is flat, electro-mobile, it uses local energy resources, it lives in a shared economy and the Internet of things – and in doing so, becomes again a global avant-garde, pre-designing the future dualistic global-local governance the world needs more than nation states. This Europe would also be slow-food and climate friendly, reactivating regional agricultural memories instead of participating in large-scale European agricultural policies, which has the perverse effects we know, here and in Africa (and which, among many other reasons and factors, is also one reason for the hunger and refugee problem of this continent). And lastly this concept would be compatible with the megatrend - or renaissance - of both republican and genossenschaftliches thinking, which is cooperative thinking, which came up in the early twentieth century and which was by the way essentially created and carried through genossenschaftliche Banken (Caissa d’Espagna, in Spain, Crédit Agricole in France, Raiff- und Sparkassenbanken in Austria and Germany). This school of thinking was everywhere the backbone of local industries. I do not need to point out that current EU policies, e.g in banking union, do quite the opposite and provide good politics and structure for big banks, not for Sparkassen; while complaining at the same time about a credit crunch in rural areas. The French revolution brought equality for all European citizens beyond classes. Today, Europe’s – peaceful! - revolution of minds must assure equality beyond nation states. And then Bismarck came along. And it worked. Nobody can predict what will be conceivable or achievable on a European level in the long term. On the contrary, this is not an entirely utopian fantasy – deliberations e.g. over the introduction of shared European unemployment insurance began in Brussels some time ago. Or to put it another way, one might also claim that without the basic principle of political equality we ultimately cannot forge a lasting political entity in Europe, starting with the eurozone. Perhaps it is then high time that we really try to understand this state of affairs! The good news is that the vast majority of European citizens have long since accepted the principle of political equality. According to a sociological study, the concept of political equality – with an emphasis on social benefits – has long been accepted by around two-thirds of European citizens. In this respect, the general population seems to be in advance of the political elites, which currently seem to be trying hard to respond to populist pressure: it is a shame, then, that no political party in Europe has so far adopted the explicit goal of political equality. In other words: Today, not the citizens, but the national elites are the problem of Europe, because they lack courage and political will! In addition, the generational dynamics of the European discussion is astounding. In essence, mostly old white men are not capable of even imagining the Europe in which Europe’s youngsters are already living. What are we offering the younger generation, who are already living in a Europe that Brussels currently doesn’t want to officially create? How might the euro-union look if we went ahead and transformed it into a European Republic, constituted by regions and metropolitan areas? What building blocks might we zoom in on? I´ll attempt to take you on a speedy tour through the eurozone, which could become the Euro-Union and then a European Republic. Incidentally, I have addressed this topic in greater detail in the “Manifesto for the Foundation of a European Republic” which I published together with the Austrian writer Robert Menasse in 2013 – and which has just been reprinted in the catalogue of Kunsthaus Zurich, which is currently running an exhibition on Europe. To begin with, we must recognise that sovereignty is held not by the states but by the European citizens as a whole. The perceived lack of a European demos, which is often reiterated in current debates (think of the German Federal Constitutional Court, for example) turns out to be false. If we could deconstruct the term “sovereignty” and rediscover sovereignty as an individual concept, we would realise that we are in fact citizens in a double sense – we are both citizens of the EU and citizens of our individual states. We would also, I hope, realize that the authority of these states is based entirely on a sovereignty that we ourselves had previously delegated to these states. On this basis, we could conceive of a new kind of European polity. In other words: even if the UK as a country exits the EU, Scots - and all other British citizens - remain as individual citizens of the EU. To this end Jürgen Habermas is developing a conceptual thought experiment on “double sovereignty” in which constitutive power consists of the totality of all EU citizens, on the one hand, and the European nations, on the other. This amounts to raising EU citizens to a position of equal sovereignty to the European nation states. Democracy and nation states would be decoupled to the extent that European citizens would, as citizens of the EU, be partly sovereign on their own. They would thus enter into an equal and heterarchic relationship with the sovereign nation states in the constitution of the European community. But one could push this over time even further: based on the idea that “Network Europe 21” has two layers – a European republican roof and independent regions/ towns – Europe could also model the US system: next to a pro rata European parliament would stand a European congress composed of two senators per region or metropolitan area, with each region/ metropolitan area having a governor. This would be compatible with the direct election of a European president, which is not utopia, but already in many party programmes of European parties today – and which would constitute an in-depth identity building exercise for European citizens in the twenty-first century. The Europe that we are picturing is thus no longer organised on a national level. It is decentralized, but interconnected – digitally, through information and communications technology, transport and electricity. It has at its disposal an infrastructure that is uniformly developed and promoted by the EU. Rural regions will develop “social nodes” again and be able to close the gap with urban growth regions and no longer be neglected. Formerly desolate rural regions will be replaced by rural infrastructure and local or regional economies relying on local energy as well as on local banks. Regions and towns will become the spinal cord in a nervous system of new, decentralized growth policies and regional clusters of industry. This new network works in support of other European development goals, such as: decentralized energy production, the use of electric-powered vehicles on a regional level, sustainable rural development, and regional agricultural structures. “Network Europe 21’s” new decentralized structure, which will link up rural areas with a network of cities, will no longer necessarily have to be organized on a national level; regions and cities will be brought together by means of a transnational democracy and on a common legal ground, that of the European Republic. As a result, the individual nation states will not necessarily be the constitutional pillars of the “Europe-21st” century project any more – instead, the “Network European-21” project will be region-based, allowing regions to remain united yet largely autonomous. This feeds back into the current regional movements, which are already staging protests against the power of the nation state, as in Scotland or Catalonia for example. This would be a win-win situation for Europe: the ability to act externally as a single entity in the international arena while achieving closeness to its citizens on the inside. 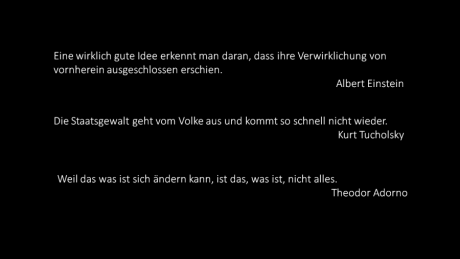 This quote from Albert Einstein seems appropriate here: “No idea is a good idea unless it first appears to be completely illusory.” In other words, the right to a utopian ideal is a human right: “Because that which exists is not all there is, that which exists can change,” stated Theodor Adorno. Now more than ever, it is our responsibility to change Europe. For Europe has not run out of options, societal processes can always change and be shaped by citizens. Now you’re perhaps asking yourselves: But how do we get from A to B? That is a valid question. And in fact, right now it looks like we won’t be getting from A to B, and a European Republic will certainly not be voted in over the EU negotiating table. This is a question that cannot be answered here. Nevertheless we can and must allow ourselves to think about the future as we would like to see it. We can allow ourselves, for the first time, to develop a clear vision of the kind of political entity we would like to create in Europe; indeed, it is even our duty to develop a convincing narrative for Europe – and then to hope that, if it becomes popular, it will gain some political weight. The idea of Europe conceived by people like Richard Coudenhoven-Kalergi or Aristide Briand in the 1920s did not really become a reality until the 1950s; even the currency union took 30 years to get from the Werner Plan to the euro: sometimes good things take time and even a historical catalyst; and the organisation of a European democracy is naturally a complex and difficult issue. We will certainly need half a century to work on it. But it is good to have a compass: without a clear goal, Europe and the EU will continue to go round in circles, as it is currently doing! The “Network Europe-21”, a European Republic composed by a network of regions and towns is not real but it is imagineable. The concept of the Republic has been the fundamental principle of political order in the European history of ideas since Plato. It is compatible with all European political traditions and languages, from Poland to Italy. The notion of a Republic speaks to us emotionally, as it point to the public good. The next step is thus merely a matter of raising awareness of the fact that, as vocal, emancipated European citizens, we hold the new political order in our hands at all times, for we are sovereign! Is this easy? By no means! How can we achieve a joint bureaucracy and protect minorities from small territories – such as the citizens of Malta, who would hardly be represented in the European Parliament any more? Is it possible to ensure this level of political arbitrage between very different regions and towns? And what about the financial tug-of-war between the centre and the periphery? And how should we go about balancing out social preferences? Is there such as thing as a European public sphere? What should we do about language? Can we make it work via the use of technology? 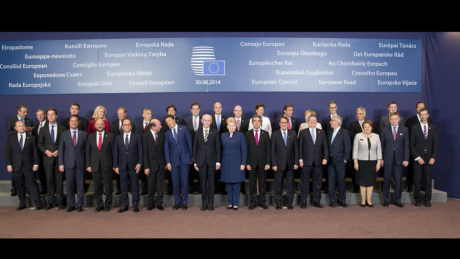 European parliamentary sessions held via I-Translate - can we imagine that? Speeches from Brussels being broadcast live on national TV in that country’s language? Academics are still quite sceptical in this respect. However, a multilingual democracy does seem to work in India, which is poor and has a high rate of illiteracy, so why should Europe not be able to have a multilingual democracy? Nothing is easy. But deconstructing the euro and unravelling Europe isn’t simple either. And we do not want to live in the monster. Indeed, we are left with no alternative but to build a European democracy: Yes we can. If we want, we can! Conversely, we have to imagine the kind of world which we are sliding into, the people who will be governing us if Marine Le Pen ends up leading France, and Jobbik leading Hungary; if the populists are allowed to continue stirring up trouble and idiocy reigns supreme. And then, after the neo-liberal revolution, a surveillance revolution might come, driven by fear and praising a misleading concept of security. It is time to remember that Karl Popper was concerned about open societies and its enemies. A world in which we once again become one another’s enemies, divided along national lines – and moreover become so preoccupied with our own problems that we forget that the world outside continues to turn, faster and faster – a world in which, in the not too distant future, we may no longer play such a prominent role: we do only make up 7% of the world’s population. What else should we really be doing, than investing all of our energies into finally creating a European political entity that works? We need to (re-)build it based on the principle of the political equality of all European citizens! The enforcement of the principle of political equality is therefore what we are calling for today. This is the emancipatory movement Europe must take on. This is Europe’s task for the twenty first century, a step forward to shaping “Network-Europe 21”. We do not need to do this all now. But we need to do a first step to escape the vicious circle we are in. The first step is to put our aim on paper as a claim. The first presentation of Europe as a map dates, I mentioned it earlier, from 1537. In 2037, this map will be 500 years old. This leaves us some 30 years to fix a republican “Network Europe 21”and to orient Europe towards a common future for all European citizens on a different basis from what we have today. Viva the European Republic! 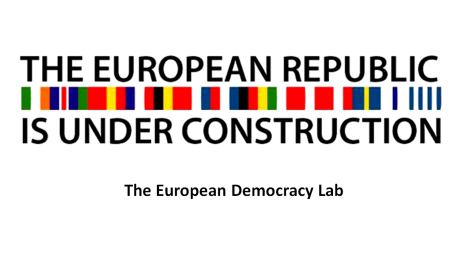 The European Republic is under construction! Come, join, sign & and help us! Cerstin Gammelin and Löw, Raimund, Die Strippenzieher (Berlin: Econ Verlag, 2014). Jürgen Habermas, The Lure of Technocracy (London: John Wiley & Sons, 2013). Pikett, Thomas, interview, “We have created a Monster”, Spiegel Online, 15 March 2015. Menasse, Robert, Reden wir über Europa (Berlin: Suhrkamp, 2014). Ulrich Beck, German Europe (Cambridge: Polity Press, 2014). http://www.foederalist.eu/2015/04/griechenland--‐fehler--‐eu--‐eurokrise.html offers a good overview of the political and economic discussion surrounding Greece. Olivier Blanchard of the IMF already acknowledged this mistake in a study back in early 2013; however the European Commission has long defended itself against these new findings. Sigmund Freud, Eine Kindheitserinnerung des Leonardo Da Vinci, Wien 1910. Karsten Nowrot, Das Republikprinzip in der Rechtsordnungengemeinschaft, (Tübingen: Jus Publicum, Mohr Siebeck, 2014). Pogátsa, Zoltàn, “Hungary: From Star Transition Student to Backsliding Member State”, Journal of Contemporary European Research, 5.4 (2009), 597. Many articles on this topic can be found at http://www.nachdenkseiten.de/?p=15990#h08, see esp. those by Harald Schumann of Der Tagesspiegel. A McKinsey Study from 2012 calculates that the gain of 10 years of Euro-making between 2002-2012 amounts to an aggregated gain of 300 billions, out of which 160 billions went to Germany. Detailed numbers on this can be found in: Schieder, Siegried, “Zwischen Führungsanspruch und Wirklichkeit: Deutschlands Rolle in der Eurozone”, in: Leviathan 3 (2014): 363–397. If you want to deepen this argument, please check out the papers of Christian Odentahl at www.cer.uk.org or read Guillaume Duval’s book ‚Made in German’y. Le mythe du model allemand, Paris 2014, for a French perspective; or Angelo Bolaffi, Il cuoro tedesco, 2013, for an Italian perspective. Deutsche Bank Research, 31 July 2014 (“Progress needs broadband: Private investment requires more government stimuli”). Pierre Rosanvallon, The Society of Equals, Harvard University Press, 2012. Jeremy Rifkin, Die Null-Grenzkostengesellschaft und das Internet der Dinge, Düsseldorf: Econ, 2103. Gerhards, Jürgen and Volker Lengfels, European Citizenship and Social Integration in the European Union, (London: Taylor & Francis Ltd., 2015); on this topic, see also Heidenreich, Martin, Krise der europäischen Vergesellschaftung (Wiesbaden: Springer, 2014). http://diepresse.com/home/presseamsonntag/1379843/Manifest--‐fur--‐die--‐Begrundung--‐einer--‐Europaeischen--‐Republik Kunsthaus Zurich: Europe – The future of the Past: http://www.kunsthaus.ch/en/exhibitions/ , where audio-files on the European Republic are available. Cf. the writings of Jean Bodin (“Les six livres de la République”) and of Hans Kelsen, Austrian Staatsrechtlehrer. These are, incidentally, the key proposed reforms which were also recently presented by the so-called Spinelli Group regarding a new EU constitution. 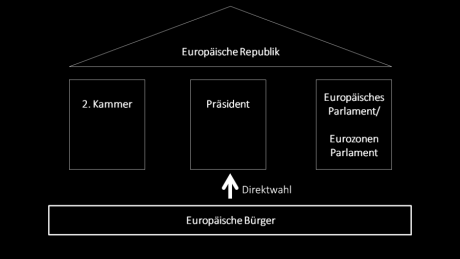 These reforms would bring the eurozone’s democracy closer to Montesquieu’s principle of the separation of powers, an idea also considered, incidentally, by the Westerwelle report on the future of the European Union from September 2012 and even earlier in the Schäuble-Lamers paper on “Kerneuropa” (core Europe) from 1994. 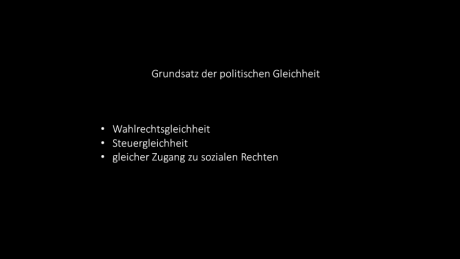 Scharpf, Fritz, “Das Dilemma der supranationalen Demokratie”, in Leviathan 1/2015; and Höpner, Martin “Der Integrationistische Fehlschluss”, in Leviathan 1/2015; and Wolfgang Streeck, op. cit.